It is nice to have something to finally talk about. The last four to five months have been "yawners" for weather geeks around this area. 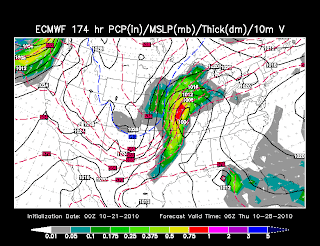 As I have been talking about the last several days, I am keeping an eye on a pattern shift for later this week that will bring the increased chance for thunderstorms across the central U.S. The Storm Prediction Center has a "Slight Risk" for severe weather in their Day 3 Outlook. The outlook covers 7am Satuday through 7am Sunday. The trend in all of the computer models over the last couple of days is to slow the weather systems down. Initially, we thought we could be seeing rain in the area for Saturday. That now appears to not be the case. There could be rain in St. Louis but probably not in southeast Missouri. 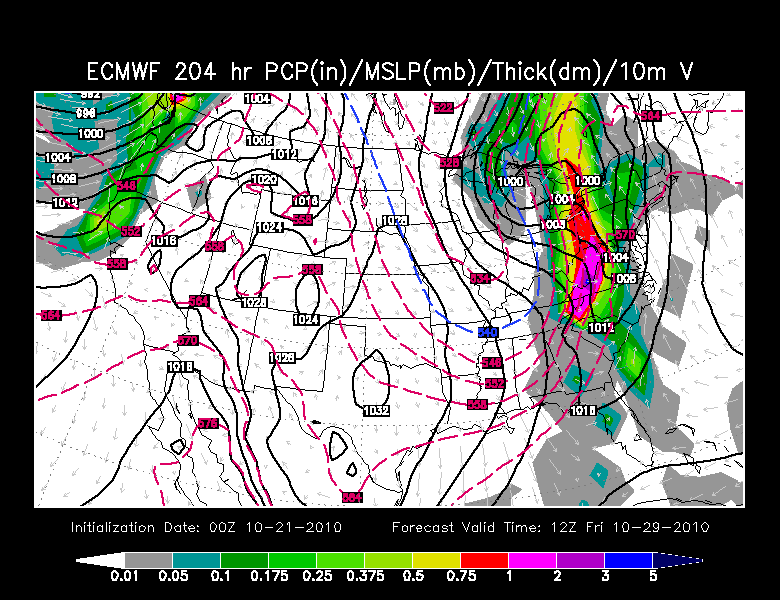 Here is a look at the European forecast agency's computer model for 1pm CT Saturday. In the above map isobars, moisture, and 500mb (approx 17,000 feet) heights. The surface low is over southeast Nebraska and moving northeast. This is taking more of a northerly track taking the rain north and west. I still think we will see some rain across the area Sunday and maybe on Monday. However, the atmosphere is becoming a little out of phase for when we would normally see severe weather. The models are hinting at more rain during the morning hours as opposed to the late afternoon evening. This will limit any severe weather threat around the KFVS viewing area. Let's skip ahead to Wednesday... 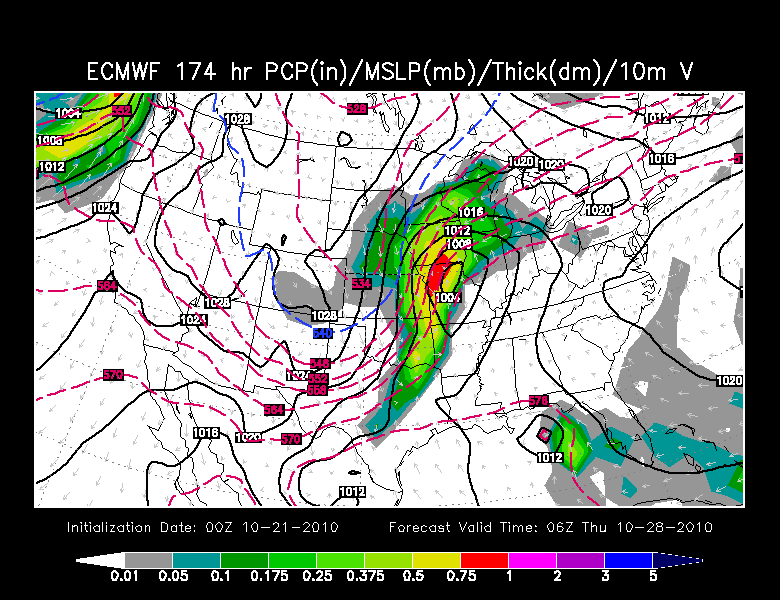 Here is a look at the European model's depiction of 1pm CT Wednesday, October 27. 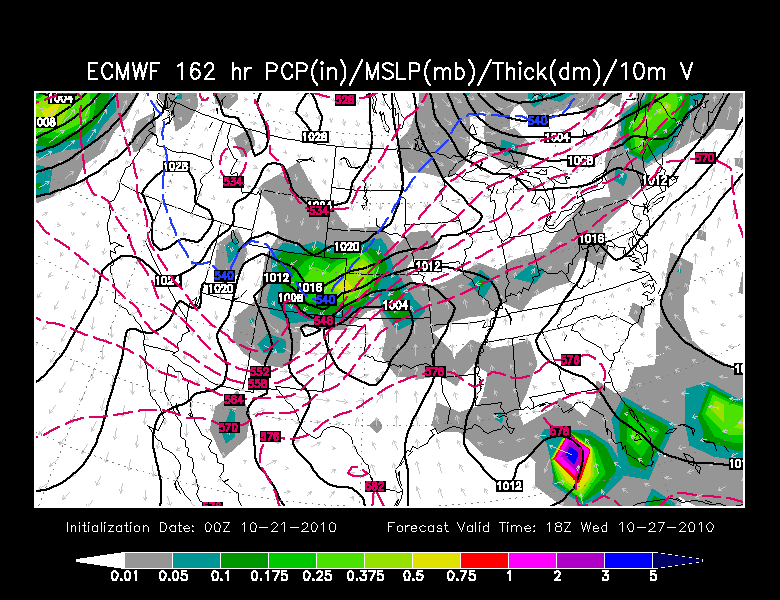 Interesting to note, the Euro never fully brings the front from the weekend/early week through the area. It stalls it out and lifts it slightly north of the area. Look at the gray blobs that extends from Kansas to New York. That is the front that is stalled out. Look at the low developing over the panhandle of Texas and Oklahoma. Woo-eee! That is a pretty good storm! 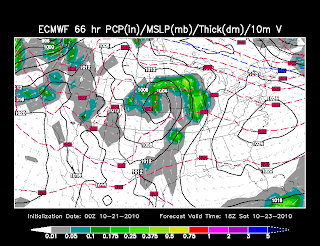 If this pans out, someone is going to get some snow dumped on them over eastern Colorado and maybe western Kansas. Now we know that this storm has to move east at some point. Right? Next up... 1am CT Thursday, October 28. The storm indeed is moving east and northeast. The low is deepening over north-central Missouri. It is winding up pretty good. The Euro is keeping the majority of the moisture on the backside of the storm. However, ahead of the storm we will be warm with southerly winds. In fact, we should be able to moisten up the atmosphere as the winds should be drawing up moisture from the Gulf. I have to believe with a setup like this, we will see thunderstorms popping up somewhere in the "warm sector" of the storm. Again, I said earlier, the timing of the storm isn't the best for the KFVS viewing area to see severe weather. This would be moving through during the morning hours. However, at this point we are splitting hairs on the back of a donkey that is a thousand miles away. This means trying to nail down a 12 hours period at something that is 174 hours away is impossible, but I'll keep looking at the trends. Now at some point this storm has to pass the area. 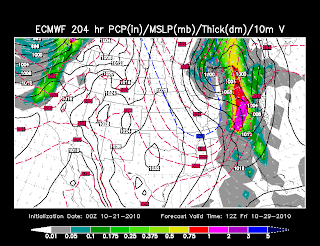 Any guesses on what will happen on the backside of the storm? Here is a look at 7am CT Friday, October 29.